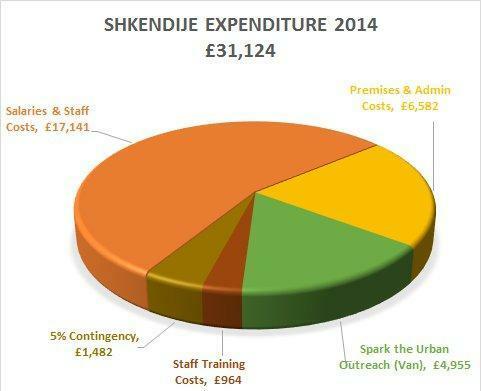 Welcome to Shkendije's newsletter! You are receiving this email because you have either signed up to be on our mailing list, you were on our old one or you know Rachel Wilson! The new Children's Gospel Tract; 5000 copies hot off the press! Children listening intently to the message. A very Happy Easter to you! This is a time where we can celebrate life and give thanks for the Easter message. Jesus Christ died for us, rose again, and lives today to be part of our everyday lives. As I read through the last newsletter we sent out and think of all the things that have happened since then, my head is spinning and I'm in awe of God's faithfulness. It will be impossible to write it all in one newsletter so I intend to bring you the main points. In this update you can read about: Introduction to the new staff, Spark the Albanian Outreach project, Vali and the work in Shengjin, Child protection in Albania, Our financial report for 2014 and What's next on our agenda? You can also check out our Praise and Prayer points. We are so very thankful too, to Robin & Bonnie Stephen and Helen Sherman who help out in different ways, approximately a day a week. The outreach van was finished in time for the Christmas outreaches which we had in Durres, Fushe Arrez and Shengjin. All the outreaches were well received and it was a good chance for us to put the van to the test. It was great to have the Mattersey Halls Mission Team here with us in March where the van was out every day apart from their last two days, as they went to Macedonia to two towns that are predominantly Albanian speaking towns, Gostivar and Tetovo. At the same time we were exploring possibilities of future partnership with missions groups that are trying to reach into those Muslim areas. See a Video clip of the Van in action. We now have several Churches that are signed up for the twelve weeks of outreach over the summer holidays and there are many others that are interested. Training has already started with some of the Churches. In the mean time material production is also in process. We've just taken delivery of 5000 copies of our new children's gospel tract, ready for the summer! If you would like to sponsor 200 copies of the children's new gospel tract you can do so for £15 or $25. Donate here. If you saw the above video you would have seen that the Van also goes up to Shengjin to help Vali and the girls with outreach in Shengjin. This Christmas, with the help of Samaritan's Purse, we were able to supply the whole of the Shengjin school and kindergarten with Christmas parcels. Together with that we were able to invite the children from ages 8 – 12 years old to take part in a twelve week course that would take them on a journey through the gospel. 80 children signed up for the course and just this last week seventy two of them have gone right through to the last lesson. In the next two weeks Vali and the girls will be preparing for a big special programme for all of those children, with prize giving and a clear gospel presentation with room for children to respond. We appreciate your prayers for this event. Child protection in Albania is an issue that Spark ministries has been concerned about for a while. Historically this has been a subject that has failed to be properly addressed, not only in many Evangelical churches, but also in many areas of Albanian society. There has been some very damaging cases of Child neglect/abuse in the past decade. This has led Shkendije to initiate a round table in partnership with the Albanian Evangelical alliance and also in collaboration with the Albanian social services, with the aim of producing an effective and applicable child protection policy with suggested good procedures, that can be applied, not only by the Evangelical community, but with the potential to be implemented on a much wider scale throughout Albania. 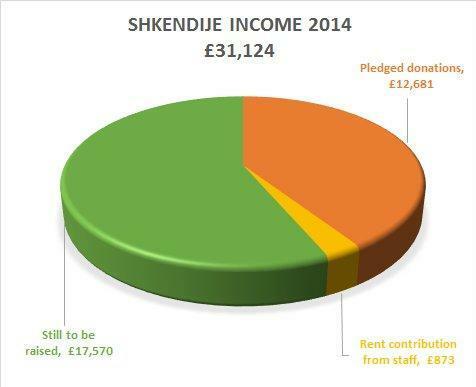 As most of you will be aware Shkendije is a faith based organisation, which has no income, apart from peoples kind donations. With the strategic relocation of our head office to the capital city, and the launch of Spark the Albanian outreach, our ministry needs have more than doubled. This has been a large step of faith, and we continue to trust in God for His provision. Please pray with us in these coming critical months. RrKK (Albanian Christian Camping Network) Annual Conference on the 2nd and 3rd of May. Finding a camp site for this summer and continuing the search for the perfect piece of land to buy and develop an all year round camp/retreat and conference centre. National Children's Day on 1st of June we'll be running a big all day Park outreach. Summer team's are already applying to help with Camp and the Spark Outreaches. There's still more help needed: Volunteer here. God's faithfulness with the weather during the Van outreaches. The Tirana Church that have signed up for partnership and are being trained for outreach. The launch of the 2nd cycle for outreaches from the week of the 9th of June. For the Children's meeting in Shengjin on Saturday the 3rd with the 72 children. For a speedy and smooth application of a Child protection policy. For sponsor and prayer partners for the new Albanian staff, taking a step of Faith to come onto team. For the needs of this outreach mission. Giving thanks with you and wishing you a Happy Easter! Follow Spark on Facebook | Forward to a friend | Find out more on our Website!